Men usually mess up when they message girls. It’s understandable, but then they wonder why they get no messages and give up, they don’t realize that THEY messed up. So here are some recommendations to hopefully increase your chances of a reply back. Messaging her with something small like “Hi”, not only wastes her time but it also wastes yours. You will not get a message this way. There’s no motion, no flow, no subject, no reason to continue the conversation. It also shows that you’re under-confident. You want to hook her in, not have a casual chat that lasts 5 minutes. Poke with her interests, mention something that you both are interested in and go from there. A compliment is sufficient, Luis, but don’t go overboard. You could say “Nice hair,” but do not dwell on her physical appearance, change the subject up after the initial “Thanks”. 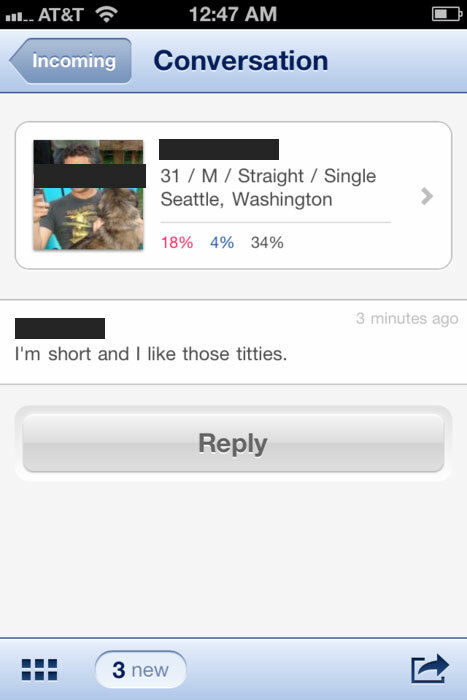 It’d appear as creepy and/or desperate if you just harp on her physical traits over a whole profile of interests. Of course, don’t be scared to compliment her once in a while since you’re both on the site probably for the same reason, just don’t remind her everyday. I can’t really stress how important this is. You probably already heard me tell you to not dwell on things, well, do not dwell on anything! Keep the Conversation interesting, answer her questions with more than one word, give her your knowledge of what you know. Don’t act like you were just born yesterday and all you can do is say “Yes” or “No”. If you have 21 years under your belt, use that 21 years to your advantage and show her what you know. If she’s disinterested, move onto something else she might be interested in. Sometimes these dating sites are a fight to keep their attention and a stale conversation will not work. This is most important. We can all act like we know this-or-that but when it comes down to it, we can get caught. Do NOT lie about yourself. If you don’t like a certain band she loves, don’t act like you love it, just tell her you’re not a big fan and keep your rants to yourself. Don’t mold yourself into something you’re not, in the end, it only confuses you and potentially loses a date. Just sell yourself for what you’re worth and get a great self-image – you deserve it. I kind wish people would slow down some and let the situation take over. I think the act of courting is a lost art. I listen to some of the conversations now and everything is in high gear. Everyone wants the hook up and the fast score. I on the other hand would love to find a woman willing to accept flowers and hand written notes . I think opening doors and paying for dinner is a start. I guess with all the technology it is so uncool as they say to take things slow and appreciate the little things in life. I don’t know if this makes any sense ,but I figured I would opine on this subject.